Casey SOPA Late Response — Better a month late than never one supposes. Sen. Bob Casey (D) finally got back to us on the request we made Jan. 18 that he oppose the Stop Online Piracy Act (SOPA) and the Protect IP Act (PIPA). Both bills were put on hold that day after massive protests. He never really did do much to stop them. 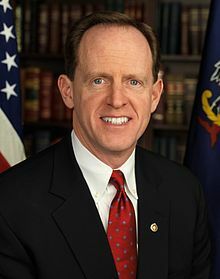 Sen. Pat Toomey (R) responded almost immediately and announced his opposition to the bills later that day. Thank you for taking the time to contact me regarding S. 968, the Preventing Real Online Threats to Economic Creativity and Theft of Intellectual Property (PROTECT IP) Act of 2011, and H.R. 3261, the Stop Online Piracy Act. I appreciate hearing from you about this issue. S. 968 was introduced by Senator Patrick Leahy of Vermont on May 12, 2011. The PROTECT IP Act would allow the Attorney General and property rights holders to take legal action against only foreign-based websites strictly dedicated to copyright infringement and intellectual property theft. After legal action is taken and a judge finds the particular foreign-based website guilty of being dedicated to intellectual property theft, payment processors such as credit card companies and other payment systems would no longer be allowed to process payments to that illegal foreign site. It would also allow the Attorney General and intellectual property holders to seek a court order to shut down websites engaging in piracy. S. 968 was voted out of the Senate Committee on the Judiciary unanimously on May 26, 2011. A version of this bill, H.R. 3261, the Stop Online Piracy Act, was introduced in the House of Representatives by Representative Lamar Smith of Texas on October 26, 2011. It was referred to the House Committee on the Judiciary, where hearings were held. Over the past several months, I have heard from numerous groups and individuals concerned that internet piracy destroys American jobs, threatens public safety—for example, through the sales of counterfeit pharmaceuticals—and violates the intellectual property rights of creative and innovative American artists, inventors and entrepreneurs. These diverse groups strongly supported the bill as a means to shut down foreign rogue websites that are dedicated exclusively to intellectual property theft. More recently, I have heard from individuals who are concerned that these bills violate their right to freedom of speech, as well as from constituents concerned that they would shut down sites like Google, Wikipedia, Facebook and YouTube. I take very seriously concerns about censorship and infringing freedom of speech. Accordingly, I was pleased that the bills were removed from the Senate calendar so that further consideration could be given to these concerns. At this point, I think it is important for all interested parties—including Internet users, technology companies and intellectual property holders—to take a step back and begin a dialogue on how to protect the legitimate rights of innovators and creative artists, and protect public safety in the face of counterfeit products, while at the same time assuring that First Amendment rights are not infringed and the further development of robust internet is not inhibited. I also look forward to new legislation being developed that appropriately balances all of these objectives. Please be assured that as this process advances, I will have your views in mind. I encourage you to visit my website, casey.senate.gov. I invite you to use this online office as a comprehensive resource to stay up-to-date on my work in Washington, request assistance from my office, or share with me your thoughts on the issues that matter most to you and to Pennsylvania. Bobby Casey Aye On Porkmarks — Little Bobby Casey, who is Pennsylvania’s other Democrat senator, voted no yesterday, Nov. 30, on an attempt to place a three-year moratorium on earmarks. Earmarks are a legislative provisions that directs approved funds to be spent on specific projects, or that directs specific exemptions from taxes or mandated fees. They are also known as pork, which makes it puzzling why Little Bobby would vote for such an unpopular thing as he is not known for being able to bring home the bacon. Of course, he is known for being able to take orders so it’s probably not that puzzling. Bobby is up for re-election in 2012. Sen. Arlen Specter, as expected, also voted for the earmarks. Arlen’s long and storied career as a public hack is forcibly coming to an end, so this vote gave him one last chance to be spiteful. The attempt to put a three-year halt to the process came via S.Amdt. 4697 which was an proposed as an amendment to S. 510 and failed on a 56-39 vote . S 510 aka FDA Food Safety Modernization Act, which many fear will destroy family farmers , passed 73 – 25. Little Bobby and Arlen were ayes on that one as well . The latest Rasmussen Reports shows presumptive Republican senate nominee Pat Toomey continuing to hold a 9-point lead over Democrat incumbent Arlen Specter, a margin he has maintained in Rasmussen polling for three straight months. Rasmussen has him beating Congressman Joe Sestak (D-Pa7), who is challenging Specter for the Democratic nomination, by 5 points. Rasmussen has Specter ahead of Sestak 48-37 in the primary contest, which is May 18. A Quinnipiac University poll released March 2 had Specter beating Toomey by 7 points and Sestak by 24 points. Toomey, a businessman who represented the Democrat-leaning 15th District in Congress from 1999 to 2005, is being challenged by activist Peg Luksik in the primary. Sen. Arlen Specter (S for Specterite -Pa) is reportedly writing a book regarding his experiences in switching from the Republican Party to the Democrat Party.